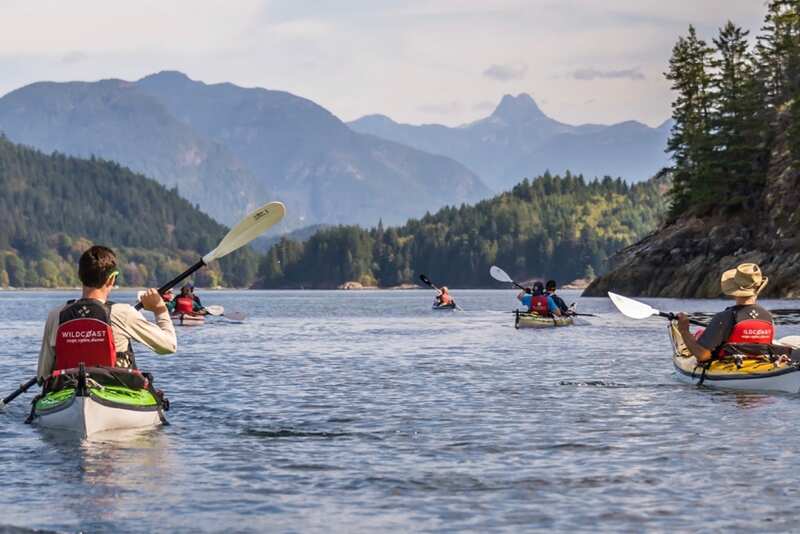 Included in National Geographic Canada’s 50 Places of a Lifetime, the Discovery Islands are a sea kayaking paradise, and as you will discover, one of the West Coast’s best kept secrets. You’ll find no better sea kayaking vacation throughout remote islands on BC’s central coast. 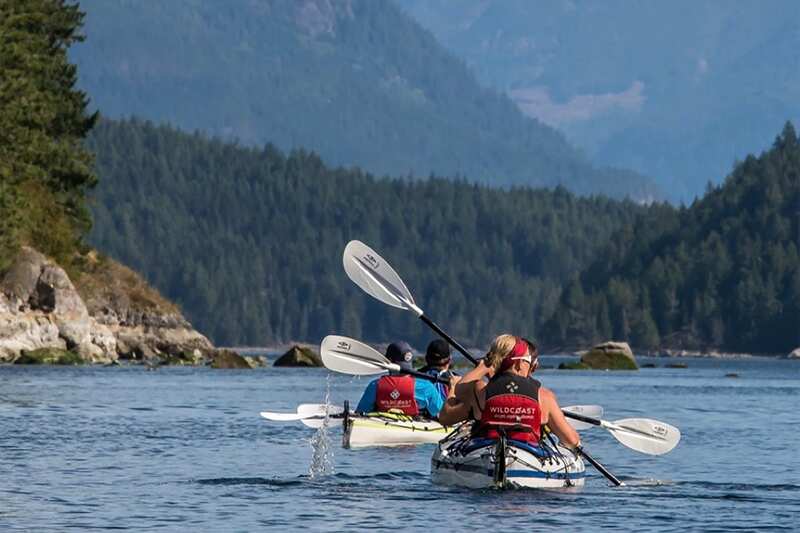 Comprised of a dozen islands in the Discovery Passage between Vancouver Island and the mainland in British Columbia, we will take you kayaking throughout this sparsely inhabited remote group of islands on this kayaking tour. Paddling around the islands provides the ideal way to get close to nature and be completely enveloped in the beauty of towering trees, remote beaches, and mountains. 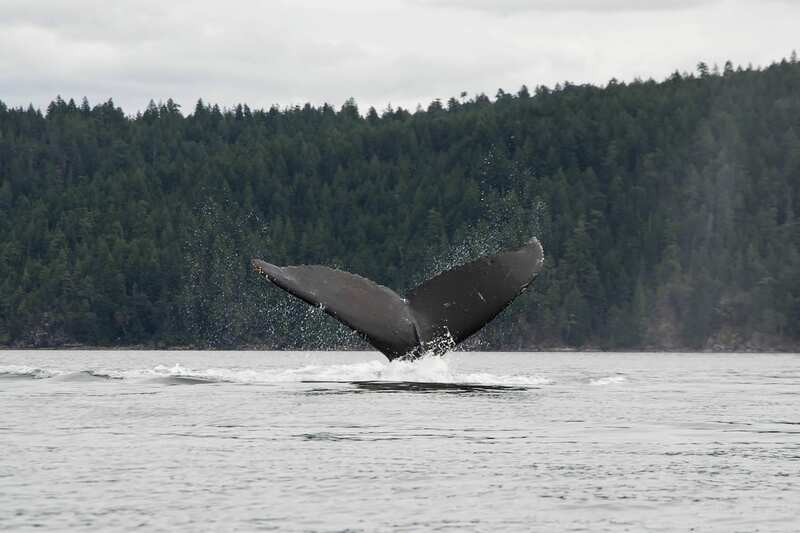 Discover the wildlife that inhabit this region and the secrets of British Columbia’s rich and plentiful inter-tidal life while exploring magical waterways. Welcome to the first day of your adventure to the Discovery Islands. To begin your journey, you will have a relaxing stay at one of Quadra’s beautiful resorts. This will give you an opportunity to enjoy Quadra Island, and prepare yourself for the coming days of world class kayaking and camping. 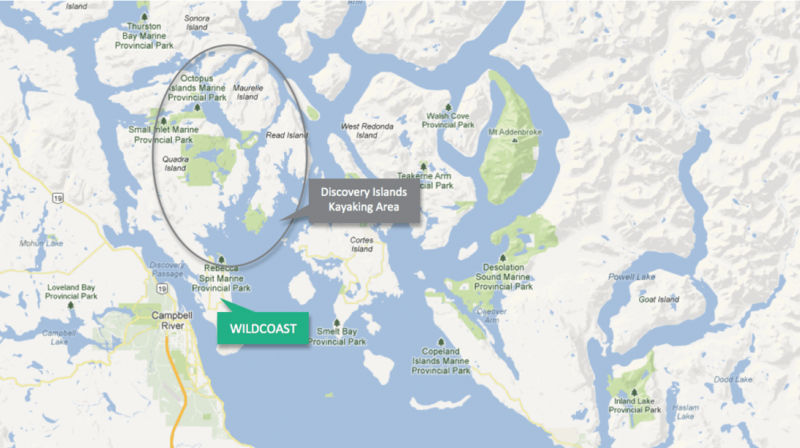 MEETING LOCATION: The office is located at 685 Heriot Bay Road just a short distance by foot or by car from the BC Ferry Terminal in Quathiaski Cove. An afternoon briefing is held on the day of your arrival. During the meeting we will provide you with a dry bag for your belongings and tell you everything you need to know before launching on your kayaking tour early the next morning. Today, we launch from the scenic and breathtaking Rebecca Spit Provincial Park, which is located in Quadra Islands Heriot Bay. It’s on this morning, that we will have a chance to ask questions about , and learn about the kayaks and gear we will using throughout the trip. Gaining personal attention from your guide, each kayak and all equipment will personalized for each participant. Accommodating each individuals needs and experience level, your guide makes sure that your experience is expertly suited to you. Today we spend our day Kayaking in the islands. As we hug the coast line, we are keeping a lookout for sea lions, seals, otters, diverse birdlife and White Sided dolphins. Making a strong resurgence in the Discovery Islands, we may also catch a glimpse of the massive Humpback Whale, if we are lucky! Enjoy each moment gliding past towering trees, mountains of the BC wilderness, and pristine remote beaches. For the next two days, we will take in the full experience of a kayak expedition. Gliding amongst the islands, we drift past a fascinating landscape, experiencing natural beauty that few can say they have. We will have the opportunity to stretch our legs, walking through ancient forests, and swimming in freshwater lakes, all the while becoming more and more comfortable on the water and in our kayaks. Your guides naturally add effortless depth to your trip, enriching the experience with their expert local knowledge and skills. Each night is rounded out with campfires and world class stargazing from camp. Today we will paddle back to our launch point . By early afternoon on this day, you will be met by a representative that will transport you back to our headquarters. It is here where you will head off to your next destination, or, stick around and explore the islands to your heart's content. 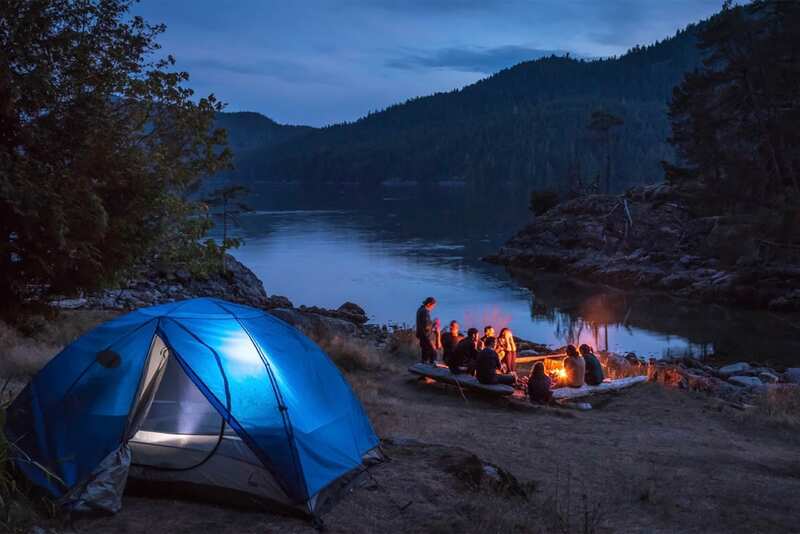 Each day you will paddle into secret bays and each evening as you take in the spectacular view towards the British Columbia Coast or Vancouver Island Mountains, campfires will warm your soul as you recount the day. In the last few years, Humpback Whales have made a strong resurgence in the Discovery Islands and have often been seen on our kayak trips. Given their wild nature, you can never be guaranteed to see a whale, but many of our recent trips have had amazing encounters. 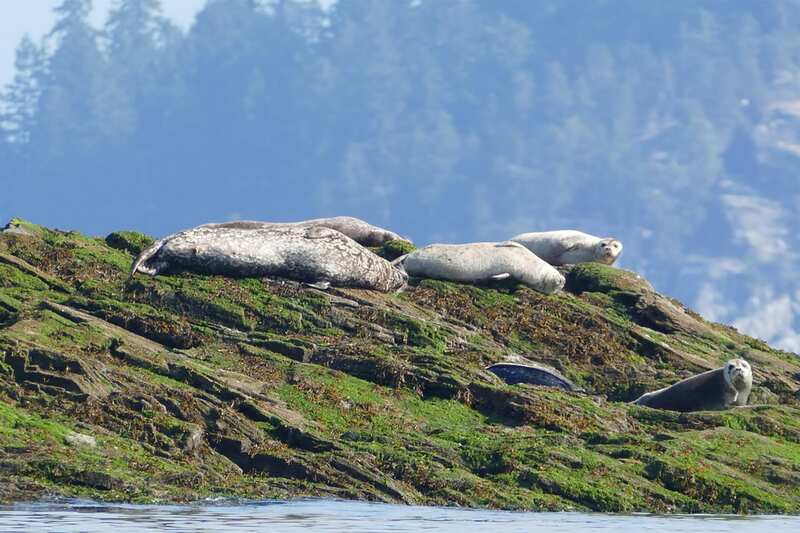 During your sea kayaking vacation you’re bound to have close encounters with a variety of BC’s coastal wildlife. This region is known for its sea lions, seals, pacific white sided dolphins, otters, colorful birds and some of the largest starfish and clams in the world. Humpbacks and dolphins aren’t the only marine mammals in this region, if you are very lucky, you may even get to see transient killer whales (orcas) who have also been spotted at times by kayakers during this sea kayaking vacation. We strive to make your sea kayaking vacation a trip of a lifetime. We know an important part of this experience is delicious, hearty, and plentiful food. For our kayaking expedition trips we enlisted a local gourmet chef to design the menu and train our guides to be excellent wilderness cooks! Fresh meals prepared each day will leave your belly full and ready for all the adventures the new day brings! All gear needed for your trip (kayaks, paddles, tents, & dry bags) is included in the trip price. Our equipment is kept in top-notch condition. From toasty sleeping bags to crawl into at the end of each day as you head off for a peaceful sleep to quality tents (including tents for singles so you don’t have to bunk with anyone else if you are a solo traveller). The maximum number of guests on any sea kayaking expedition is 10 and our staff to guest ratio is 1:5 or better. There are a large selection of islands we can explore in the Discovery Islands chain. Quadra Island, Read Island, the Octopus Islands and the Penn Islands are some we have explored on past kayaking tours. For each trip, our guides select the kayak routes based on your group’s kayaking skills and level of experience. You will enjoy a couple nights at one spot, or if you are with a more advanced group your kayak expedition could be racking up the nautical miles circumnavigating one of the more remote islands. To further enhance your overall sea kayaking experience, guides love to share their wealth of knowledge about the area. Included in your sea kayaking vacation package is the first night at one of Quadra’s beautiful Resorts. A relaxing start and an opportunity to enjoy Quadra Island as you prepare for the spectacular days you will spend kayaking and camping throughout the Discovery Islands. On the day of your arrival a briefing at the resort will provide you with everything you need to know before launching on your tour early the next morning.